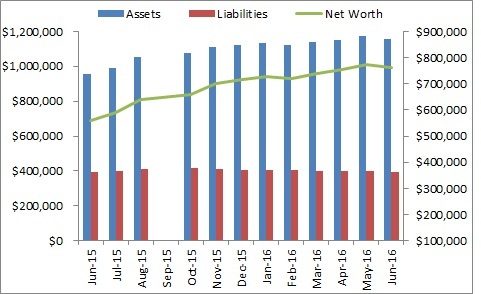 As I mentioned in my June 2017 Net Worth post, I will be popping back in periodically to update my net worth on this blog. As I mentioned in that post I have been spending far more of my time working on my net worth and improving it rather than writing about it and I think the results are really paying off. When I first started tracking my net worth in July 2011 I had a net worth of $120,000. For it to have grown 10x in 6.5 years absolutely blows my mind. As you can see I haven't really had any change in my liabilities over the year and the increase from $880,000 to $1,300,000 was entirely driven by the increase in my assets over the year. While I love blogging about financial topics and personal finance, I found that I was spending far more time talking about finance and investments rather than taking control of my own financial life. It doesn't mean that I was not doing the things I was saying that I was doing. There was just a lot of "this month I will do x, y and z" and honestly a lot of that stuff never got done. In addition to this I decided that I needed to concentrate far more on my career and my time at home got taken up with a new addition to our family. Actually with all the time I freed up by not having a posting schedule (and by giving up my industry blog that I started as well) I found that I had far more time to dedicate to my own personal finances. I still track my net worth every month and I my plans have evolved significantly since the last time I posted on here. I'm going to go through a quick summary of my net worth, the changes that have happened over the last year as well and then will cover quickly what my new plans look like. As you can see I have managed to increase my assets significantly over the last year while holding my liabilities flat. My liabilities are fairly basic - I have a home loan, some credit card debt (which is rolling and I pay it off every month) and some tax liabilities which come due once a year. The differences in totals are due to rounding at various asset classes but don't worry my numbers add up on my spreadsheet. Now that we can see what is actually going on in my asset portfolio we can have a discussion about what I've actually been doing and changing. Broadly speaking my investment assets fall into two categories that you can see above. 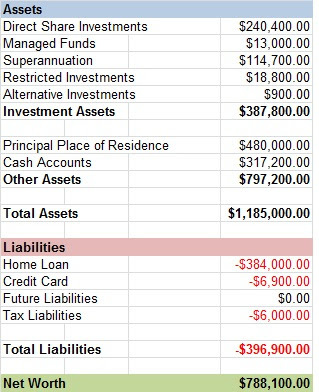 Controlled investment assets and restricted investment assets. Restricted investment assets include my retirement accounts (the majority) and employer restricted shares. I have little to no control over these and I don't add excess amounts to these accounts so let's set them to one side for the moment. Controlled investment assets are where I've been concentrating my efforts and in the last year these accounts increased by ~60,000. When I first started this blog in 2011 I was in my mid 20s and I wanted to be rich. Not just comfortable but rich. In fact as you can tell from the title of this blog I wanted $90m and I was willing to do anything to get there. Over time my priorities have changed. I value lifestyle and living a full life as far more important than I used to and as such my financial priorities have changed as well. I discovered the FIRE (financial independence retire early) community and a lot of what they had to say inspired and motivated me. Now I'm not looking to retire particularly early but financial independence and having investment income to cover my living expenses sounds pretty appealing to me. It gives me the flexibility to perhaps pursue a life where I earn slightly less but perhaps get to live a little more. This would cover the lifestyle that I currently live with a bit of a buffer and would allow me to be comfortable even without a job. Now why do I keep mentioning 2016 dollars? Because inflation eats away at the spending power of your money. $100,000 today is not the same as $100,000 15 years from now. So am I back for good now? Well...no. I found that being able to concentrate on my investments and career has really started to pay dividends for me and given it's working for me I'm going to continue with it. That being said my aim is to update my progress on these big goals on occasions. Given that it is a slow moving target I'm currently thinking semi annually seems about right.